This is a 12 Ounce Bottle of Foam Tack Glue from the Subterrain Lightweight Layout System by Woodland Scenics. 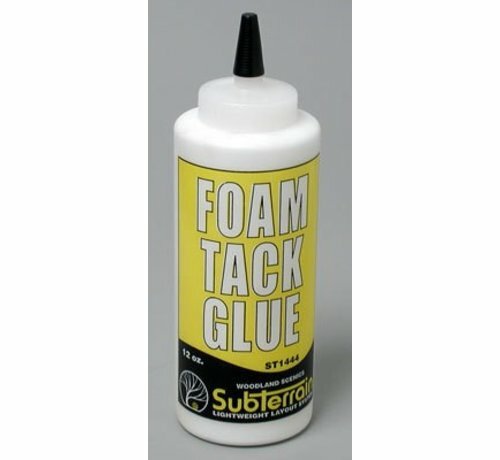 FEATURES: Specially formulated non-toxic, water soluble glue will not damage foam. Dries clear and is flexible. Use to adhere track, roadbed and foam. Can be used on foam, wood, cork, Homasote and Upsom board. Working time: 15 minutes Plastic bottle with cover for spout. INCLUDES: One 12 Ounce Bottle of Foam Tack Glue. REQUIRES: Putty Knife or Spatula, Foam Nails.